Along with Lafite Rothschild, Ausone, and l’Eglise Clinet, Pavie is one of the wines of the vintage. An inky/purple color is accompanied by notes of creme de cassis, kirsch, graphite, and toast. 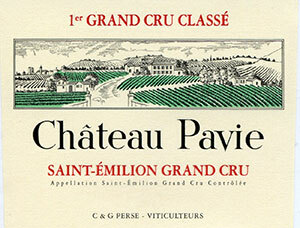 A massive wine for the vintage, the 2007 Pavie is very full-bodied with extraordinary intensity, power, and richness. Its structure and tannin suggest 2-4 years of cellaring is required, and it should evolve for 25 years thereafter ,an unusually long aging curve for most 2007s. Yields were 25 hectoliters per hectare, and the wine is a classic blend of 70% Merlot, 20% Cabernet Franc, and 10% Cabernet Sauvignon. The natural alcohol level came in at 14%. Tasted at BI Wine & Spirits' 10-Years-On tasting, the 2007 Pavie has a very clear, almost refulgent color in the glass. The bouquet is well defined with plush crushed strawberry, raspberry, cedar and mint aromas on the nose, almost Margaux-like in style thanks to a floral tincture. The palate is medium-bodied with grainy tannin, cedar and graphite-tinged black fruit that gently grips the mouth. There is impressive structure here, a Pavie that seems to have firmed up in recent years. As I suggested in my previous note, this is one of the few Saint Emilion wines that merit cellaring. Tasted February 2017.